First Edition published by Amber Quill Press/Amber Allure, 2009. I'm not entirely sure how to review M4M, as I don't want to ruin another reader's enjoyment by giving away too much. However, one could deduce what occurs from the blurb. 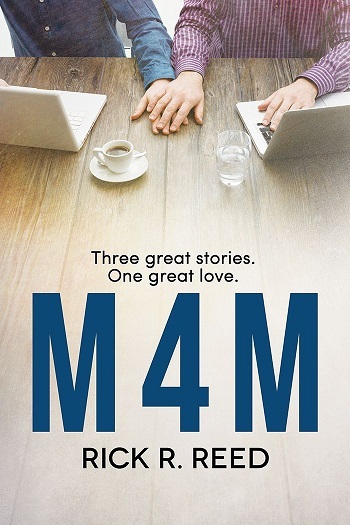 M4M is told in three parts, spanning a decade. During 2/3 of the book, Ethan is in his early forties, down on himself and the romance game. He decides to try internet dating, going to a site that wasn't for hookups but for relationships. But, while there, he sees the same immaturity and vapidness infecting the interactions. With his actual face, he gets no hits. On a whim, as an experiment, Ethan only changes his profile image, but nothing on his profile, to see if that changes things. Just as Hannah and I didn't get along during Hungry for Love (yet another catfish), Ethan and I didn't mesh, and this did have me struggling a bit. However, Ethan was written authentically, realistically, with a personality that is very human. Flawed. Lacking any self-reflection or self-awareness, judgmental of others yet self-deprecating, jealous – these are all negative personality traits, but each and every single one of us has some of them. It's the human condition. So, while Ethan and I would have never gotten along in real life, I appreciated his point-of-view, no matter how narrow and self-focused it may have been. Ethan was incapable of seeing life through the different lens of another's perception. I'm generally the voice of reason, so the unethical practice of catfishing really, really rubbed me the wrong way. I was trying to root for Ethan, he was the novel's hero after all, but he needed a wake-up call, big time. What I appreciated the most was the author using a demographic that is usually ignored in most genres. People over forty as the main love interests, both of them. Also, added on top of that, neither were fit, silver foxes that had younger men drooling for their attention. Ethan and Brian were everyday middle-aged men, and it made the story more authentic. With that being said, I felt Ethan was very immature for his age, his mental signature – the catty thoughts, the way he didn't take responsibility for his own actions, didn't see how his actions/reactions had an impact on Brian (during part two). Mad props, as the author maintained the characterization. But, as I said, it was a personality type I couldn't relate to, nor handle in real life. I'm a walking mirror, reflecting back at people, and people don't appreciate that. Ethan needed such a person in his life. When it came to part three, I enjoyed the more subdued, mature, wise Ethan. He's in his early fifties now, and living with HIV, having found and lost love, that has given him the tools to self-reflect, even while deep in grief. I adored wise Ethan, even as I empathized and cried for him. But, true to his characterization, he was still catty and judgmental, especially with Ben. Inner-monologue-ing about Bubbles. I'd been waiting for Bubbles to resurface, knowing after the beginning there was more to come. Ben's words of wisdom struck a chord, both with me (the reader) and obviously with Ethan. In a way, I wish this part was expanded more, but I have an active imagination and can fill in the blanks. Ben was an interesting character. Parts One and Two, while I was intrigued, wanting to know more, Ethan's attitude, his inability to see outside of himself, made it difficult for me to connect with both him as a character and with the story. I appreciated the HIV blog – the entries and comments, creating a highly authentic read. Part Three was my favorite part of the story, even with grief riding shotgun. Reviewers on the Wicked Reads Review Team were provided a free copy of M4M by Rick R. Reed to read and review. Thanks so much for reading and reviewing my work. Confounded or not, I'm glad you got something out of Ethan's journey.